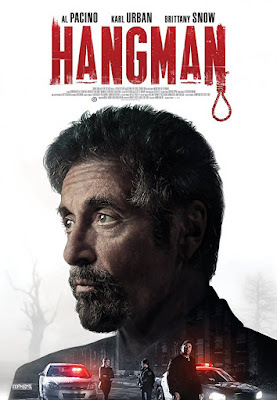 The is a trailer for The Hangman. It was written by Michael Caissie, Charles Huttinger, and Phil Hawkins, was directed by Johnny Martin (Vengeance: A Love Story), and stars Al Pacino, Karl Urban, Britany Snow, Sarah Shahi, Joe Anderson, and Chelle Ramos. There is no official release date at this time. Check out the synopsis and trailer below. "A homicide detective teams up with a criminal profiler to catch a serial killer whose crimes are inspired by the children's game Hangman."